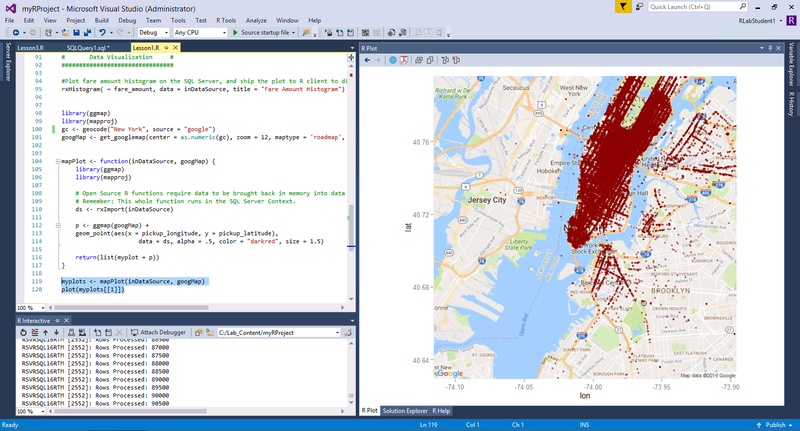 In this post I will provide list of most important publically available Data Science with Microsoft R Hands-on Labs which we use in MTC New York for Microsoft R workshops. To start doing labs provided below it’s a good idea to have a general level of predictive and classification Statistics, and a basic understanding of Machine Learning and Open R language. (For this you may use DAT204x Introduction to R for Data Science, DAT209x Programming in R for Data Science and other courses from Microsoft Data Science specialization). edX: DAT213x Analyzing Big Data with Microsoft R Server by Seth Mottaghinejad. (16 hours; contains videos, scripts; you may also earn Microsoft certificate; uses New York Taxi dataset; please let me know if you experience any issues with ggplot2 and ggrepel). Cognitive Toolkit (CNTK) Deep Dive and Hands-on (tutorial; video). Here is one of screenshots from the first (highly recommended) training based on New York Taxi dataset. The Data Science Virtual Machine has all of the tools you will need to work with the materials. You will need Microsoft Azure subscription for this. To use subscription to Microsoft Azure you can sign up for a free account here or you can use your MSDN subscription. To create the Data Science Virtual Machine in Azure please login to Azure Portal and create the virtual machine. (New -> Search for “data science” -> select “Data Science Virtual Machine” -> Create). Optionally you may test your Microsoft R code on top of HDInsight Spark cluster created in Azure Portal. If you would like to work with some of the tools locally, please install following components. Visual Studio – the Community Edition (free) is acceptable – Version 2015 preferable. Install R Tools for Visual Studio. Optionally you may use RStudio. Optionally you may install SQL Server Developer Edition for SQL Server related content.